The members of this division are characterized by their yellow-green color. So, the members of this division are called yellow-green algae. The division includes 76 genera and 376 Species which are included in a single class, the Xanthophyceae. 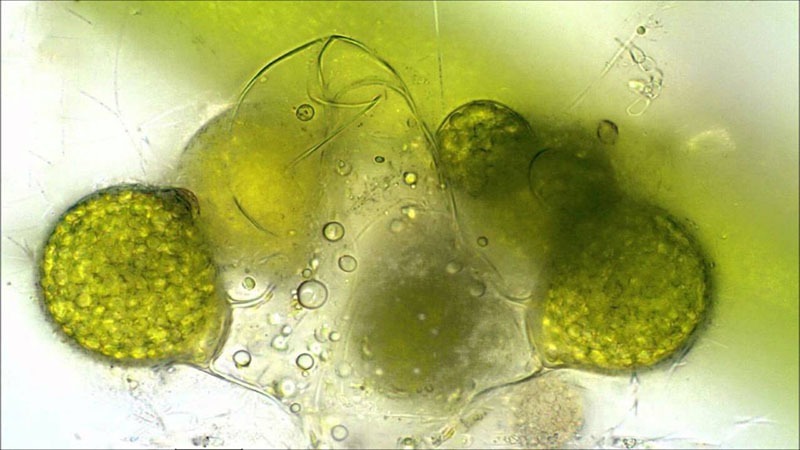 A majority of yellow-green algae are freshwater but some of the species are aerial growing on tree trunks, on damp walls or soil on drying mud. A few species are marine e.g., Halosphaera. The members of the class show a wide range in thallus structure. The thalli range from unicell (Chloramoeba, Choromeson) to palmelloid state (Chlorosaccus), and also through the filamentous (Tribonerna, Heterococcus) to the siphonaceous habit (Vauchena, Botrydium). The xanthophycean cell has a definite cell wall chiefly composed of pectic substances either pectose or pectic acid. In many genera, the cell walls are in the form of two equal or unequal overlapping halves. The cells in motile genera have two unequal flagella attached to the anterior end. One flagellum is tinsel type and the other whiplash type. The pigments are located in discoid chromatophores and consists of chlorophyll- a, chlorophyll-e, beta-carotene and xanthophylls. Chlorophyll-b is absent. The dominant pigment is a xanthophyll diadinoxanthin which provides the cells its characteristics yellow-green color. The pyrenoids are absent. The chief reserve foods are oil, lipid and leucosin (chrysolaminarin). Many genera have uninucleate cells while others have multinucleate ones. The members of the class usually reproduce vegetatively and asexually, but in few genera sexual reproduction is also found. The asexual reproduction may be by zoospores, aplanospores and akinetes. The sexual reproduction is rare and is generally of isogamous type found among the siphonaceous genera like Vaucheria.